A talk to open a Friday night, all day Saturday workshop. Trinity had written into its parish profile their desire for a rector who would continue their development of member mission. Their new rector arrived in November 2006 and quickly set the dates for the workshop; Trinity Church, Milford, MA; March 2, 2007. Hey folks, it’s great to be with you this evening! We are all gathered here to take the next step down the road with member mission. 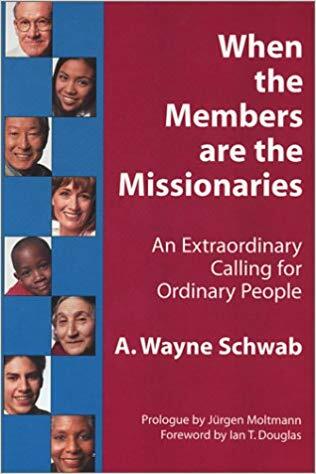 I hear you have been working on thinking about your missions in the church and how you can better live them out. Tonight, we’ll expand that thinking into what happens out in the world because that’s where we all spend the vast majority of our time. This may seem like a very new idea. You don’t really think about working for God as you prepare your taxes or attend a meeting at work, do you? But if you think about it, it won’t take you very long to see how much you would like to see changed for the better almost everywhere you go. Everyone wants a boss that offers constructive criticism as opposed to one who belittles subordinates. We all want teachers who take their craft seriously and try to communicate information so every child in the class can benefit. And don’t we all want honest politicians? What we’re talking about here is moving mission out of the church and into the world where it is most needed. We’re talking about living out our faith every day. But lately, that’s gotten a pretty bad name. So often, we see living out our faith as pushing beliefs on others or as trying to convert unwilling people. But that’s just not it. Yes, we want to help everyone know Jesus because we have found it so meaningful and central to our own lives but that’s not all there is to being a Christian is it? Think of Jesus. His teachings were so often about matching the inside of the person to what he or she did out in the world. Get right with God inside and then use that relationship to color everything you do. “Love your neighbor as yourself.” “Forgive your brother seven times seven.” “Pay Caesar what is due Caesar and pay God what is due God.” These are just a sample of lessons linking your inside belief to your everyday actions – and that’s what we’re talking about. How does this look in action? Let me give you several examples. They say there’s no religion in schools. Ha! As a substitute teacher, I pray all the time: before school, during school, and after school. I try to run any classroom I’m charged with using Christian values. I encourage the kids to do their best, behave well, and I always try to link what they’re learning to how it might be used in the outside world. So often, what kids are learning can seem to have no value to them at the time because they need help thinking in a larger framework. Earlier this week, I got to substitute for a high school German teacher. The night before, I got out some of my favorite German CD’s, researched the artists, and even translated some of the lyrics. The next day, once the students got their work done, I played the music and told them about the artists. I wanted them to see that studying German is not just a bunch of “der, die, das” but that this is a country full of interesting people who are just like them. They make good music; they have lives a lot like theirs. They just speak a different language. But studying that language allows you to enter their world. I see that message as helping them understand that we are all children of God, more alike than different, and all worthy of respect. Perhaps legally I can’t say that, but didn’t I communicate it just the same? You see, even when religion is banned from a public place, when aware Christians enter that place, they are able to bring their faith to life in novel ways. That’s member mission. I can’t pray with my students, but I can pray for them, and for their families, and for them to understand the information I am presenting. Even when faith has to be more private, it is still powerful, and can still change the world. In my local community I’ve started a ladies’ club after realizing I couldn’t pick most of my neighbors out of a line-up. That’s sad and it was certainly not the neighborhood that God would want for us. We have since added a variety of services to our subdivision, including a neighborhood watch program which to me is one way to live out Jesus’ charge to, “Love your neighbor as yourself.” A few women of faith in my community have asked me why I do this and I’ve been able to tell them that I do it because I feel called to by God. These are just two examples of living out your faith through member mission: the first is an example of one where faith cannot be discussed and the second where it can, guided by one’s own judgment on how best to do that. But there are thousands of other possibilities. You’ll be defining a number of those for yourselves this weekend. Now you’re wondering just how you might get started doing this. How do you choose from the myriad of options open to you? That’s what we’re going to talk about at this workshop. Shortly, we’ll be guiding you through a set of worksheets to help you discover your daily missions. This may seem at first a bit tough to grasp and then a rather long, involved process. It’s O.K. if you feel that way because at the end of it, you will have in front of you in written form, exactly what you feel God is calling you to do right now. Wow! Just think about what you can do with that. You see, without going through this process, you may have only a vague idea of what God wants you to do but not necessarily know how to make it happen. This will help you figure that out. Your plan, which we call a ‘Road Map’, is a way to take all of your best intentions and identify just what steps are needed to make them come to life. Because we all know how life goes. You want to do something but, without a real plan, it’s hard to get it done. Life can just run over you. If you don’t write down on your ‘To Do List’ to get your car oil changed, how long will it take you to get that done? If you’re like me, it’ll happen with the next full moon. Working for God is no different. You have to know where you’re going. Once you start working through your plan, you will be shocked at just how effective you can be and how many of your prayers actually get answered. I always am. When you start tracking your missions, you’ll see that God really does work through you and, as He does so, you’re going to have to update your plans and set new goals. So, let me tell you now, your pencil is your friend as is your computer for quick updates. But here’s the most important thing about all of this. Doesn’t everybody want to know why they’re here? And, more importantly, doesn’t everybody want to matter, to count in this world? This is why you’re here and how you matter and how you can make a difference in this world. Turn yourself over to God, let him define – even if it’s just a little bit at first – what you do every day. Trust me, He will put you to work using every tool at your disposal. He’ll stretch you, mold you, and show you parts of yourself you had no idea existed – all while giving you the most important work of your life to do. This is your legacy and gift to the world and only you can offer it.